Sang Young Lee is originally from Busan, South Korea, where she grew up next to beautiful coast. For her music study, she came to Ottawa University in Kansas in 2008. Recently, she has played with numerous orchestras in the states including St. Joseph Symphony Orchestra, Kentucky Symphony Orchestra, Richmond Symphony Orchestra, and Queen City Chamber Orchestra. 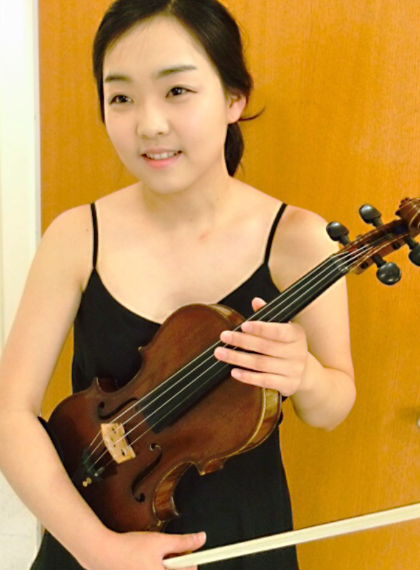 Sang Young Lee is a 2011 graduate of Ottawa University in Kansas with full-ride scholarship, where she studied Violin Performance. Immediately, she earned her Master of Music with Graduate Student Award at the College-Conservatory of Music (CCM) at University of Cincinnati with Piotr Milewski. Currently she is finishing up her Doctor of Musical Arts (D.M.A.) through CCM. Sang Young Lee participated in the Green Mountain Chamber Festival, worked and took master classes from Lee Fiser, Sandra Rivers, Ariel Quartet,William Grubb, and Emerson string quartet. After coming back to Kansas in 2015, she has enjoyed teaching violin performance to young students ranging from enjoyment in music to college preparation. When not performing or teaching, she spends her time with her husband and beautiful daughter in Overland Park, Kansas.